A super-smooth matte gesso primer ideal for fine art and decorative painting. It creates a suede-like, non-grainy finish and requires no sanding. 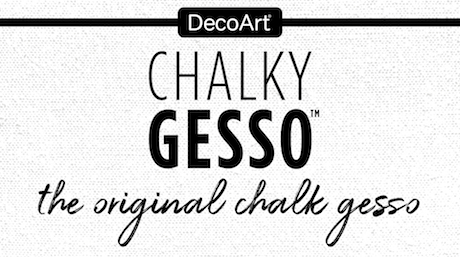 Chalky Gesso fills in the divots and natural texture of canvas or wood to create a smooth, even surface. Oil and acrylic paint glides across the primed surface easily. Available in 6 neutral colors and 2 different sizes, Chalky Gesso enables artists to customize their primed background and enhances their finished designs. 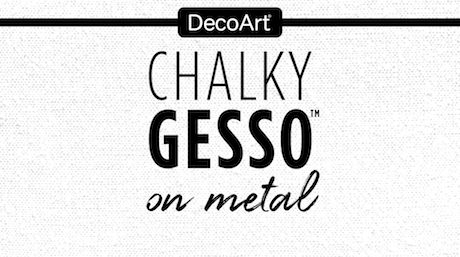 Chalky Gesso comes in 6 neutral colors. Create the ideal surface for acrylic and oil painting with this super-smooth matte gesso primer. Forms a suede-like finish on canvas, wood, and more. 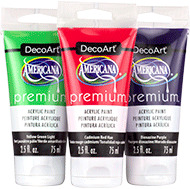 Ideal for fine art and decorative painting projects. Directions: Apply with a soft brush. Dry completely before use. No sanding required. Water-based. Permanent. Soap and water clean up. To minimize brush strokes, dampen your brush before painting and use light pressure when applying Chalky Gesso. Wipe off the brush after applying the last coat and softly brush the surface again with little to no pressure to soften any visible brush strokes. To increase the smoothness, add generous, additional coats of Chalky Gesso to your surface.The surface can be sanded for even more smoothness. Create a textured background by applying Chalky Gesso with a palette knife, brushing in a cross-cross pattern, or carving into the wet gesso. Add plaster of Paris to create interesting dimension on projects. Chalky Gesso can be used easily with stencils. Simply glide Chalky Gesso over a stencil with a palette knife or use a stencil brush. Recycle previously-painted canvases by lightly sanding the canvas and adding two or more coats of Chalky Gesso. To increase the smoothness of the surface, allow the first coat to dry and add an additional coat of Chalky Gesso. 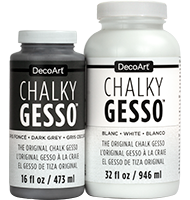 Ensure that your glass surface is clean and dry before applying Chalky Gesso. Use light pressure when painting on the glass to ensure the paint lays uniformly on the slick surface of the glass. 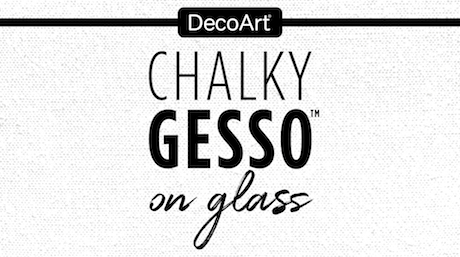 Chalky Gesso should be used on glass only for decorative purposes. We do not recommend baking for durability, soaking, or washing. If the surface needs to be cleaned, we recommend using a damp cloth to wipe away the dust and debris. Medium-bodied paint that offers excellent coverage from its light-fast, heavily-pigmented formula.